← NESTCAMS AND BLUEBIRDS IN SCHOOLS–PROVIDED BY THE VIRGINIA BLUEBIRD SOCIETY. HOW ‘BOUT THIS? A CLUTCH OF SIX WHITE BLUEBIRD EGGS! I have had a bluebird box for years. This year we got our first white eggs. I thought some other bird made a home in there. I watched and sure enough its a Bluebird. (only 2 white eggs). Usually we get 4 to 5 blue eggs. I live in Central Virginia. 8 percent average bluebird females will lay white eggs. Fun to see! Thanks for sharing! Just now finding this website and happy to report that today we checked our box and found five white eggs. Last year we also had a clutch of white eggs, so we assume the same mother is back. We live in the Upstate of SC. WOW! Never knew this would happen! What would cause this. Sure they are BB eggs? 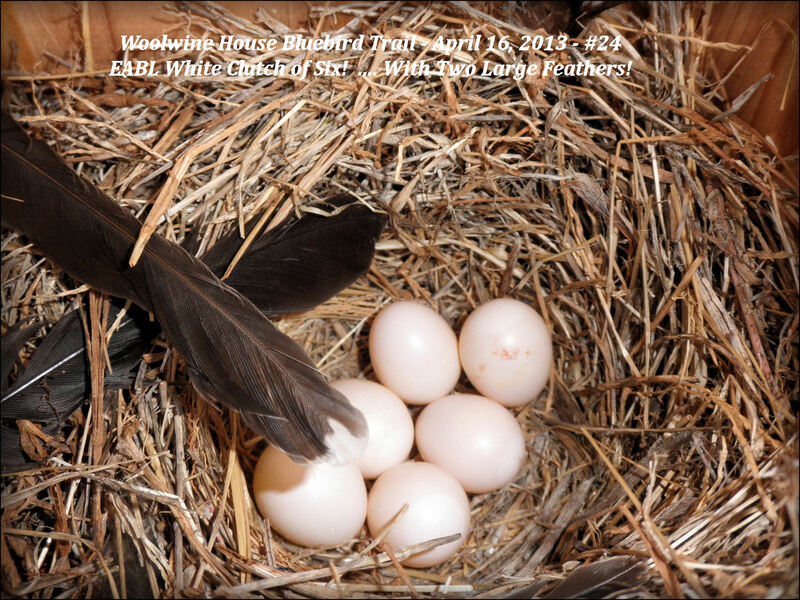 YEP…Eastern Bluebirds I had white eggs in 2011. Did you read my full post with explanation of why white eggs will happen occasionally?